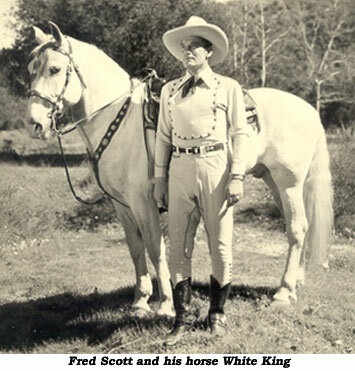 “ROMANCE RIDES THE RANGE” (‘36 Spectrum) Inept beginning as Grand Opera sin-ger Fred Scott goes west. Several out of focus shots and sound so primitive you can hear the cameras whirring. Former vaudevillian and double-talk artist Cliff Nazarro is the comedy relief. Carl Mathews, who played heavies, was Fred’s double in all the pictures. archer Howard Hill (as Scott’s Indian friend) who taught everyone in Hollywood how to use a bow and arrow. Comedy relief again from Cliff Nazarro. “MOONLIGHT ON THE RANGE” (‘37 Spectrum) Probably the best of the Scott’s as he plays a dual role for the first time and does well as his outlaw half-brother, Killer Dane. Al St. John joins the series as Fred’s sidekick, Fuzzy, which also lifts the film. “FIGHTING DEPUTY” (‘37 Spectrum) Not Fred’s shining hour. Quite dreary with several unfunny segments between Fuzzy St. John and his pie-making gal pal. Helped a bit by the always enjoyable menace of Charles King. Songs assigned Fred are just plain bad. “ROAMING COWBOY” (‘37 Spectrum) Pretty much paint-by-the-numbers B-western made palatable by Robert Hill’s direction. Fred sings three Stephen Foster tunes. 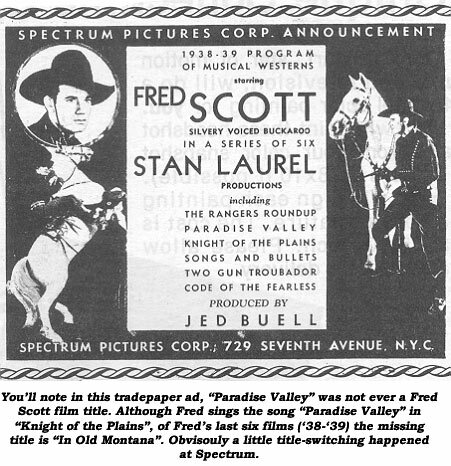 “RANGER’S ROUND-UP” (‘38 Spectrum) Fred pokes fun at himself, “I could sing higher but I’m afraid my eyes would pop out.” Leading lady Christine McIntyre also hits the aria trail. Her cross-eyed piano player is Lew Porter who wrote most the ditties Fred sings in his series. Earle Hodgins is at the top of his medicine-show-spiel game here. Stan Laurel’s comedic influence is obvious in this entry which should have been more serious. “KNIGHT OF THE PLAINS” (‘38 Spectrum) Fred has the best of his many screen set-tos with lantern-jawed heavy John Merton. “SONGS AND BULLETS” (‘38 Spectrum) French-accented non-actress girlfriend of producer Stan Laurel severely hampers this outing. Inane songs cramp Scott as a singing cowboy. “CODE OF THE FEARLESS” (‘39 Spectrum) Gotta wonder about the merits of a western that starts off with hero Scott washing his feet after his horse has been stolen and ends up singing an operatic aria while riding a jackass. Very little action. Fuzzy’s last with Fred. “IN OLD MONTANA” (‘39 Spectrum) A drop in quality as producer C. C. Burr takes over here, replacing Al St. John with Harry Harvey—still called Fuzzy. Too many silly songs and not enough action. 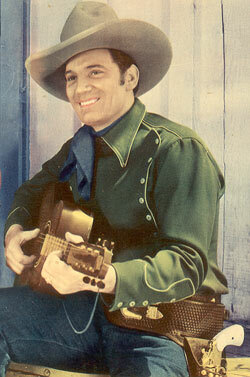 “TWO GUN TROUBADOR” (‘39 Spectrum) Another dual role as Fred plays his own father, then the Two Gun Troubador (wearing a black outfit, cape, dime-store Lone Ranger mask, sporting a black mustache and affecting a sorry Mexican accent). Harry Harvey is back and “Albuquerque” song is reprised. Film is notorious for a no-retakes terribly fluffed line by Scott. ZERO “RIDIN’ THE TRAIL” (‘40 Ziehm) Opening action is told in a written prologue getting this second adventure of the Two Gun Troubador off to a crawl from which it never recovers. Harry Harvey is Fuzzy again. ZERO “RODEO RHYTHM” (‘42 PRC) Amateurish, juvenile time waster is an excuse to put various kiddie acts through their paces.